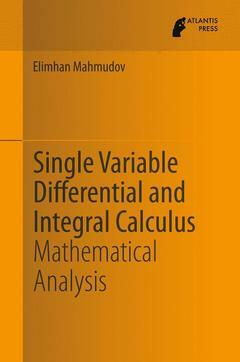 The book “Single variable Differential and Integral Calculus” is an interesting text book for students of mathematics and physics programs, and a reference book for graduate students in any engineering field. This book is unique in the field of mathematical analysis in content and in style. It aims to define, compare and discuss topics in single variable differential and integral calculus, as well as giving application examples in important business fields. Some elementary concepts such as the power of a set, cardinality, measure theory, measurable functions are introduced. It also covers real and complex numbers, vector spaces, topological properties of sets, series and sequences of functions (including complex-valued functions and functions of a complex variable), polynomials and interpolation and extrema of functions. Although analysis is based on the single variable models and applications, theorems and examples are all set to be converted to multi variable extensions. For example, Newton, Riemann, Stieltjes and Lebesque integrals are studied together and compared. Introduction to Numbers and Set Theory.- Sequences and Series.- Limits and Continuity of Functions.- Differential Calculus.- Some Basic Properties of Differentiable Functions.- Polynomials and Interpolations.- Applications of Differential Calculus to Limit Calculations and Extremum Problems.- The Indefinite Integral.- The Definite Integral.- Applications of the Definite Integral.